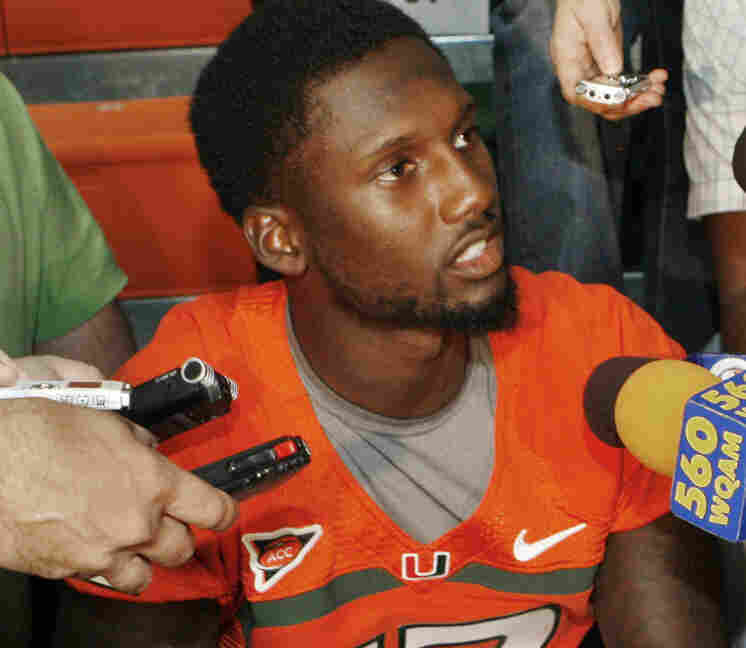 8 Miami Hurricane Players Suspended, Must Repay Benefits : The Two-Way The NCAA handed down the punishments after a convicted Ponzi schemer said he provided impermissible benefits to 72 student athletes. The NCAA has ruled that eight Miami Hurricane players will sit out games and repay benefits they received in order to entice them to play for the University of Miami. Starting quarterback Jacory Harris and four other players must sit out one game and make repayment. Olivier Vernon will miss six games and repay $1,200. Ray Ray Armstrong and Dyron Dye will sit out four games. Marcus Forston, Sean Spence, Adewale Ojomo and Travis Benjamin will sit out one game. As we've reported, the allegations of illicit gifts came from a University of Miami booster and convicted Ponzi schemer Nevin Shapiro, who told Yahoo! Sports that he "provided thousands of impermissible benefits to at least 72 athletes from 2002 through 2010." The Miami Herald quotes UM's athletic director as saying the eight student-athletes who were suspended "have acknowledged receiving improper benefits and will now be responsible for restitution and, in some cases, the student-athletes will also serve game suspensions." The paper also has details on the repayments. Armstrong owes $788; Dye owes $738, while "Forston received more than $400 in extra benefits. Spence received approximately $275; Ojomo $240; Benjamin $10 and Harris $140." The NCAA has posted the full press release on its site. The release says the student athletes received extra benefits from Shapiro and from other "athletics personnel." "This university has the highest standards in all of our academic and athletic endeavors. We will remain steadfast in our commitment to continue to build winning programs with the utmost of integrity. We will be more vigilant in our compliance and continue to work with the NCAA on the joint investigation to determine the facts. "We appreciate the diligence and understanding of the NCAA staff and its handling of the student-athlete eligibility issues in an expeditious manner. I would also like to thank Coach [Al] Golden and his staff for their professionalism and leadership over the past few weeks."